The City of Oslo started removing more free street parking on Monday. City officials are targeting the affluent west side district of Frogner first, with thousands more spots on the chopping block next year. 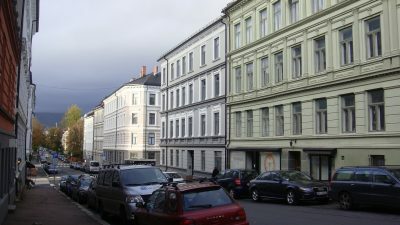 All registered car owners in Oslo’s Frogner district received letters from the city less than two weeks ago, informing them that the free street parking they’d had for decades would start being subject to new regulations and fees on November 20. Many parking spots have already been removed and replaced with bike lanes or planter boxes and so-called “outdoor furniture” during the past year. Now free, unregulated parking would also disappear in residential areas. Most all local streets where parking fees and hourly restrictions already hadn’t been introduced are now regulated either by hourly parking fees or special stickers for which neighbourhood residents must apply. The so-called beboerparkering (parking for residents) doesn’t come free, either, however. Residents must now pay NOK 3,000 (USD 366) per car per year, with no guarantee street parking will actually be available. Many residents are furious with the city government, led by the Labour, Greens and Socialist Left parties, that’s trying to discourage the private use of cars in Oslo. In Frogner alone, it means that around 4,700 parking places on residential streets that have always been free are now effectively being taxed. Newspaper Aftenposten reported that in some areas, 24-hour parking will be available for non-residents, but at a cost of NOK 129. Owners of electric vehicles will also be able to avoid all fees and time restrictions, and that’s also angered local residents. They fear the so-called el-bil owners, who also are exempted from road tolls, will continue to commute into Oslo and park their cars in residential neighbourhoods, taking up the precious parking that’s supposed to be earmarked for residents. The city is sure to rigidly enforce the new parking regulations, which can result in fines of NOK 600 if violated. Aftenposten reported that the program, once operational, will generate around NOK 106 million annually for the city, which will be used to cover the costs of its implementation and then go into the city’s “parking fund.” Its proceeds are used for traffic safety measures and street upgrades, and to help fund public transport. City Council member Eirik Lae Solberg of the Conservative Party told Aftenposten that the program means “many people will have to pay an extra tax without their street parking situation necessarily getting any better for them.” Andreas Halse of the Labour Party disagreed, claiming that it should become easier for residents to park. “NOK 250 a month to gain access to parking where you live isn’t so much,” Halse claimed. The program will be extended to the St Hanshaugen neighbourhood from December 11, to Gamle Oslo from January 8 and Oslo’s popular Grünerløkka district in April or May next year. Next will follow Sagene and various streets in the Ullern, Nordre Aker, Alna and Stovner districts. That will mean removal of another 15,300 free parking spots in Oslo by the end of next year.